If you already have a car trailer hitch installed to your car and require a bike rack, then a hitch mount bike rack is the perfect solution. 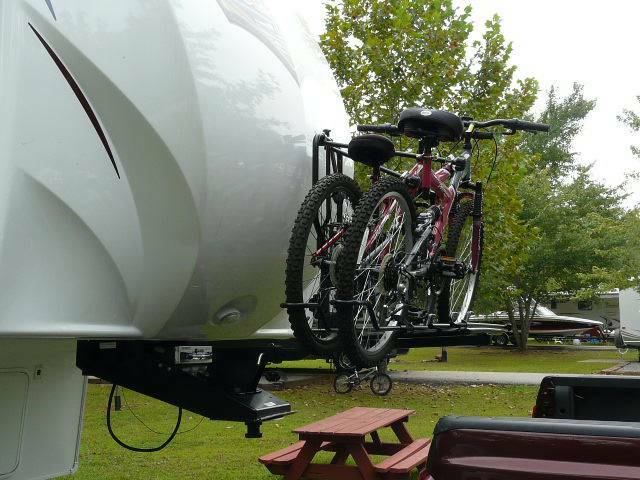 Trailer hitch bike racks are the easiest to install and many comes with the option to carry up to 5 bikes. The best hanging hitch bike rack is the Yakima RidgeBack, which comes with a limited lifetime warranty and options for 2, 4 and 5 bike rack. The best platform hitch bike rack is the Thule T2 Pro with its tool-free installation and impressive tilt feature. Hitch bike racks come in two main types and these can be classed as hanging and platform mount bike racks. In short, the hanging bike racks hold via the frame of the bike whereas platform alternative hold them by the bikes wheels. If you drive a low car or a particular type of car with low ground clearance, you will need to ensure that your bike rack does not ground out. However, the majority of racks are lifted above the hitch height, therefore as long as you are not catching your hitch all the time, you should be perfectly fine with a hitch bike rack. Trailer hitch mount bike racks are by far the easiest to use ans suffer from the least amount of air drag on the road compared to the alternatives. Below is a list of the best hitch bike racks that can carry up to 5 bikes safely. Yakima and Thule are the two most popular premium brands when it comes to bike racks and other clever car storage facilities. However, the Yakima has the winning advantage when it comes to hanging bike racks with the impressive RidgeBack model. It uses a tool-free locking “SpeedKnob” that quickly connects to your car trailer hitch (both 1.25 and 2 inch). The patented “UpperHand” lever allows you to also tilt the rack downwards, which allows you easy access to the trunk of your vehicle. The Yakima trailer hitch bike rack is available as a 2, 4 or 5 bike rack where all come with a limited lifetime warranty. They are also very lightweight, for example the 2 bike carrier weighs jut 32 LBS yet remains very solid under load. In terms of the safety of the bikes, they are kept secure with “ZipStrips” and anti-sway cradles that limited contact of the bikes. Overall, it is the best trailer hitch bike rack that uses a hanging mechanism and allows access to the hatch. The Vertex XT hitch mount bike rack is Thule’s most popular hanging type of carrier and is slightly cheaper than the Yakima alternative above. It will fit the majority of trailer hitches that are 1 1/4 or 2 inch and it features an increased mast height for improved ground clearance, which is great for low cars. To avoid bike to bike contact, Thule uses “Hold Fast” cradles that cushion the bikes on the rack and use anti-sway cages for limited movement. It is available as a 2, 4 and 5 bike rack and is a highly rated trailer hitch mount bike rack with the reputable Thule build quality. Compared with the Yakima alternative, it is slightly more heavier and installation is more involving and requires tools. Overall, it is highly rated worldwide and the best hitch mount bike rack for clearance. Allen Sports are building a reputation for developing high quality bike racks and rooftop carrier at an affordable price. This hanging hitch mount bike rack is available as a 2, 3, 4 and 5 bike carrier for 1.25 and 2 inch hitches. One issues that some people may come across is that it doesn’t particular look good. However, the important thing to remember is that its a cheap hitch bike rack suited to those who want to load their bikes to their vehicles in the cheapest way possible. Overall, it is the best trailer hitch mount bike rack for the money that uses the hanging mechanism. If you own professional bikes worth thousands of dollars, we recommend going for the Yakima or Thule alternatives. Thule offer a range of trailer hitch mount bike racks but this platform carrier is one of their most rated. It is a tool-free auto attach installation and removal as well as a frame free ratcheting arm for securing the bikes quickly without contact. As with the Vertex XT model above, the T2 Pro XT has a switch lever that easily tilts for allowing access to the rear hatch of the vehicle, which is a very desirable feature. This model will only carry 2 bikes but you can purchase the Thule T2 Pro XT 2 Bike Add-on if you require an additional 2 bike carrying space. As the platform bike hitch secures the bike via the wheels, its important that you take some measurements. The T2 Pro XT has a maximum tire width of 5 inches and is suitable for wheel diameters between 20 and 29 inches. In terms of protection, this model allows a generous amount of bike clearance for limited contact. Compared with the Yakima alternative below, Thule certainly have the advantage with the platform mechanism. It does have one drawback, which is the price but the functionality and build quality is certainly worth paying the extra for. Overall, it is the best trailer hitch mount bike rack that uses a platform mechanism for carrying the bikes. It is a premium rack suited for expensive bikes that require additional safety during transportation. As with the Thule hitch bike rack, this Hold Up model by Yakima only carries 2 bikes out the box but there is an additional “add-on” if you require an extra 2 bikes. This model is the latest model and has improvements such as the stronger arm pivot and the side-to-side adjustability. As bikes come in a range of styles, this hitch bike rack allows you to adjust the space between the bikes, which is an excellent and unique feature. It also has no limited with regards to the tire width but as long as the diameter is between 20 and 29 inches. Overall, it is an excellent trailer hitch mount bike carrier and is much cheaper than the Thule T2 Pro. However, it just lacks the build quality and aesthetics but it does have its own unique features that may be desirable for many people. Unlike the Thule and Yakima alternatives, the Hollywood Racks HR1400 Sport Rider is able to carry 4 bikes without an expensive add-on. It is a platform style trailer hitch bike rack that comes pre-assembled for a straight forward installation. There are limitations to the tire width, with a maximum of 3 inches, which for offroad mountain bikes may be an issue. However, they do offer a “fat tire kit” but as you would expect, it is an additional option that comes at a price. In terms of trailer hitches, it is only compatible with a 2 inch receiver, which may be a problem for some vehicles. Overall, it is a cheap platform style bike rack that uses a “no wobble, no tools” hitch tightening system for a simple installation. The affordability, build quality and ability to hold 4 bikes results in its popularity worldwide. 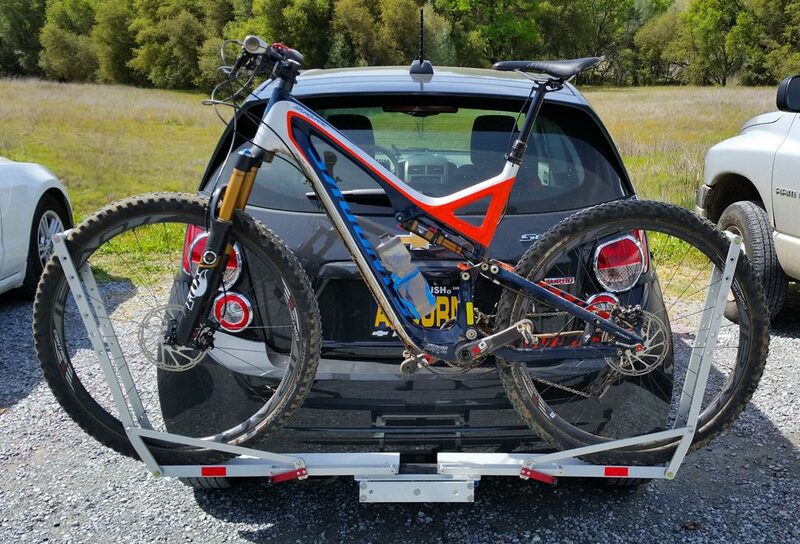 Trying to store your bike inside of your car is simple not worth the hassle as you can get multiple car bike racks. The three most common are the trunk, rooof and hitch bike racks with the latter being the most popular due to the ease of loading bikes. They come in two styles, which are known as hanging or platform and we go into detail of both below. The most popular hitch bike rack brands are Thule, Yakima, Saris, Allen Sports, Kuat and Swagman with the majority being listed within this article. Before you throw yourself in the deep end, take time to read our buying guide. All platform racks secure the bikes via their wheels and generally protect the bikes more than the hanging style below. They are generally more expensive too but if you have a premium bike that costs thousands and is constructed of a carbon fiber frame that is easily damaged, a premium example such as the Thule bike rack will ensure maximum safety of your bike. Bikes will sit on top of the platform carrier with the tires locked down with a range of adjustable wheel holders. You will notice that we have stated the tire width and diameters for the platform hitch bike racks as this will cause some compatibility issues. For example, if you have a mountain bike with fat tires, you will need to pay particular attention to the width and maybe purchase an optional “fat tire” extra, which is offered by the Hollywood Racks carrier. Many platform style carriers are only able to handle 2 bikes out of the box but most brands (Thule and Yakima) provides an “add-on” for adding 2 more bikes holders. However, when adding options like this, the price starts to creep up, which for those on a budget is not ideal. If you have a large quantity of bikes needing transporting, it is probably more cost effective going for a hanging hitch bike rack. The cheaper hanging style bike carrier holds onto bikes via their frame, which may put many bike enthusiasts off this style straight away. This is because the frame can easily become damaged during loading and transportation, which for expensive bikes can be an expensive repair and ruin them aesthetically. They are also known for sway, which is another risk to the bikes as bike to bike contact will causes damage. However, all the recommendations above use an anti-sway cradle that prevents the swaying and reduces the risk of damage. Most hanging style hitch mount bike racks offer the ability to hold 5 bikes without the need of any add-ons. Therefore families that are going on holiday with their kids can fit all their bikes on fairly easily. To conclude, if you are looking for a cheaper option of carrying your bikes via a trailer hitch bike rack, the hanging style is ideal. It does require slightly more effort loading the bikes onto the carrier and more risk of bike damage but families with “average” bikes will not be worried by slight contact of the bikes. Compared with many of the alternative bike racks such as the trunk or roof styles, the hitch mount is the easiest to install. Many do not even require any tools and simply clamp onto the hitch whilst maintaining excellent connection with zero movement. 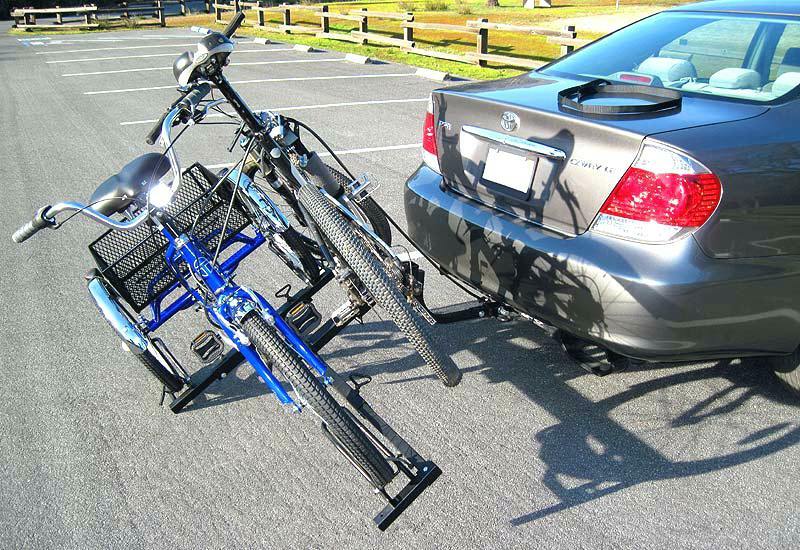 Before departing on a long haul journey, be sure that you test the bike carrier on a short drive. This drive should involved multiple bumps, turns and of course high speeds for a thorough test. You will also want to ensure that the hitch mount is properly secured and many brands such as Thule and Yakima have their own receiver locks. However, you may choose your own trailer hitch lock as a cheaper alternative. Getting into the trunk without the need of removing all the bikes and the rack is a highly desirable feature and this is achieved by a tilting mechanism. All of the recommendations in this article will tilt for allowing your trunk to open. Of course, some car manufacturers have different methods of opening the hatch, which may cause issues. However, a small amount of tilt will provide enough room for you to access the rear regardless of the hatch design. Below is an example of the tilt found on many trailer mount bike racks. Ground clearance is a factor that often forgotten about but can cause a lot of damage. For example, if you drive a low car with limited ground clearance at the rear, you may ground out the rack over a large incline or deep pothole. This will results in the rack going under immense stress and potential for the bikes to become severely damaged. If you notice you are catching your trailer hitch (without anything connected) on a regular basis, then you will need to check for a raised mast height. Thule hitch bike racks have this integrated and it will make a big difference and ensure maximum safety of your rack and bikes as well as making your driving more comfortable and stress free. The majority of standard trailer hitches are 1.25 or 2 inches and most hitch mount bike racks provide the option to choose between the two. Of course, there are a range of custom hitches as well as those that use weight distribution hitches for other towing applications. With a WDH, most come with a standard hitch or additional accessories (shanks) so that they are able to work in different situations such as using a bike rack. Of course, you must have a trailer hitch installed and they can be expensive but they are a worthwhile investment. 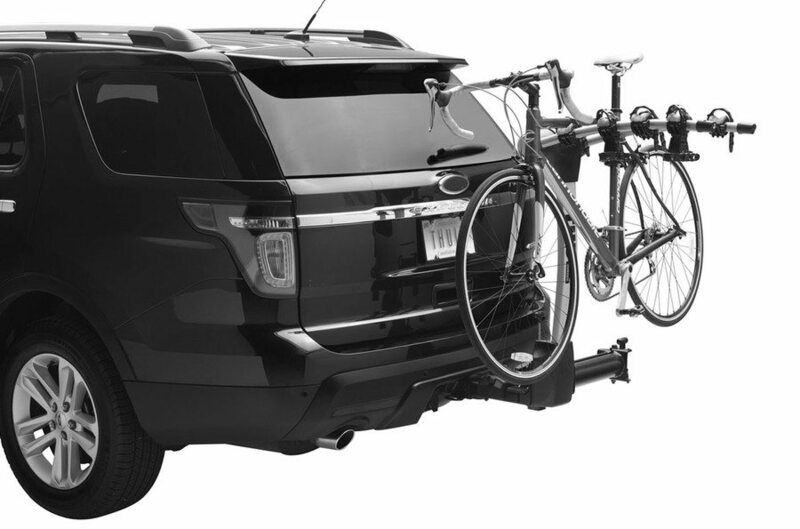 If you have expensive bikes, we highly recommend going for the platform style hitch bike carrier but if not, a hanging style will hold more bikes and is much cheaper to purchase. Thule and Yakima are the most popular brands but they do come at a premium price. Most hitch racks will last many years and come with good warranties for peace of mind. Hopefully our recommendations in this article provide you with a solution for transporting your bikes safely. Check out the American Made Lolo Racks! Carry 6 bikes (including kids bikes!) easily with zero fuss. Hey Joe – Have you got a link to these? Would love to look into these!